My fiancee, Mary, and I are extremely grateful to be able to live our current lifestyle. Had I known during the initial bus conversion that TODAY was possible, I would have stopped worrying and become less negative and stressed out. I now know to trust in the process; that the initial thoughts and intentions you set out with, are the ones that will come true, even if you get side-tracked. Piece by piece, the bus home gets built, your life’s pieces start fitting together, and once you persevere through it all, you’ll get everything you ever dreamed of and hoped for. The world moves too fast for us. We’re more of a “Life in the Slow Lane” kind of people; the bus coasts at a top speed of 67mph and it’s actually even more fun as a stationary home. Currently we are parked on a 6-acre property among old growth trees in the Pacific Northwest, paying $200 plus electric each month for rent. We are a young couple in love, living in a converted school bus. Today Mary and I woke up to the bright orange sun peeking its head through our back bedroom windows. Today could be whatever we wanted it to be, as we had no alarm set to be anywhere or any plans to do anything. Waking up in my own bed, comfortable and warm, with a roof over my head and my fiancee laying next to me, I knew it was going to be a great day. Mary lives by the phrase “the sky is awake, so I’m awake.” As soon as the sun touched her eye lids, she jumped to her feet, got dressed and was out the door to run some errands. She likes to get up and do stuff, while I enjoy sleeping in some. After another half hour or so in bed, not even 8am yet, I grabbed my phone to start reading “Debt: The First 5,000 years” which I was able to download as a free PDF file. I love technology! I have several other books I’m in the middle of, but this was recently been introduced to me and I find it a fascinating and pertinent subject of study. Especially with the rise of decentralized, digital forms of value, such as Bitcoin. I’m extremely interested to learn the history of money and debt, bartering systems, and cycles of financial ups and downs – perhaps I can learn something to improve our finances in the long run. I grind up the fresh beans which we bought at a local cafe, and get the water boiling. While that's heating up, I thought to myself "No matter the preparation, there is nothing better than coffee and a good book." A few minutes later, just as I sat back down in the dining room section of the bus, sipping my tasty coffee and clicking around on my phone, Mary stepped back on the bus. “Smells great in here, could you make me some coffee?” She asks. “Wouldn't you know it, there's an extra cup for you!” I told her, as she sat down on the couch. My fiancee has been feeling the allergies lately, living in the woods with all the spores, pollen, and stuffs flying around. Today she was not particularly feeling good. Being back home, she has no reason to leave the bus the rest of the day. We have the entire rest of the day to spend together, anyway we want. Mary will be the only person I interact with today. We have come to a point where we can afford, money and time wise, to have days like this and have taken actions to live this life, which we absolutely love. Days like this are great for recovering the body and the mind. She found herself a cheap e-book to read as well, Annihilation. It’s becoming expensive to buy books, even if they are from thrift stores and second hand book stores. Yesterday she read two hardcover books back to back. She’s the absolute fastest reader I know, it’s extremely impressive. I read this article a while back, basically saying that at my pace I’ll maybe read another 600 books if I live to be 80, where as she will read like 4,400. That’s something to keep in mind whenever you pick up a book – how many more are you able to read in your lifetime? We shared breakfast together, and continued reading into the afternoon. Once I read enough about Debt and the idea of "how much do we really owe each other?" I brought out my laptop to start writing. Being a writer, I’ve committed myself to a daily minimum of writing 1 to 2,000 words – starting a new piece, working on another, or finishing something else. I decided to focus on what’s right in front of me. This blog post is what I set out to accomplish today. I have the ability to do that, write about whatever I want, and for that alone – the freedom to choose my day’s work – I feel today is the most perfect day. There was no where I wanted or had to be, and no one else I'd rather spend the day with. I am home. I am able to write; working on what I love the most. Reliving memories, creating new ones, transforming thoughts into black and white text understood by you, the reader, wherever you currently are. You know more of me, yet I know nothing more of you. She continued reading to herself while I wrote. Both of us were less than an arms length away, even though shes on the couch in "the living room" while I'm sitting in the "dining room." Every now and again, she’d read a certain interesting passage to me. “Why don’t you just read the whole thing to me?” I asked her. She then started reading out-loud to me. The story was fantastic and I wanted to know more about it, yet not wait to read it myself. We had never done this before, reading to each other through a whole book. As she was reading to me, I thought about the day we spent on a remote logging road campground for 3 days and 2 nights. The full day we were there, we decided to spend it in silence with each other. We wrote to each other in a notepad when we wanted to communicate. We sat together on the bed and looked into each others eyes, uninterrupted, for more than 2 minutes, something we realized we had never intentionally done that before, in earnest. How much do we really see each other during the day? We are together in this 189 square foot bus, which at times it's difficult to have our own space, since it’s all shared space all the time. Yet, with that little exercise, we realized that while we pay attention to each other, feel each other, we don’t always SEE eye to eye. 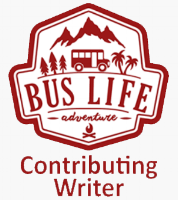 Living in a bus, we feel each other’s movement in the bouncing of the chassis on the rubber tires. We are more connected through this bus than we ever could be in an apartment or house. We are planted to the ground through rubber, yet lifted in the air, always ready to move. My thoughts drifted from the day at the campsite back to the current moment, where my fiancee's voice was reading to me about hypnotism, uninterrupted and wild nature, foreign spores impacting the way the lead biologist saw the world - it was all extremely fascinating. The effect of this cannot be understood without being there. The beauty of it cannot be understood, either, and when you see beauty in desolation it changes something inside you. Desolation tries to colonize you. I had continued writing, making up what you are currently seeing, when it dawned on me that I should not divide my time to both writing while thinking and listening to her, so I shut the laptop down and joined her on the couch. It was nice to feel her lungs and voice vibrating as I laid close to her. Feeling so close to another person, on a (mostly) daily basis, has been such a blessing in our lives. She soon finished the book, and it was awesome! We found out there were two more. And! Timely enough, Annihilation is still playing in theaters, so we decided to watch that tomorrow. The sun was setting, a beautiful spectacle that we can see right through our bus windows. The time has passed slowly, yet the day is winding down. We made dinner and sat together, spending the rest of our quiet evening talking about our thoughts, feelings, and where we would like our life to continue to go. We are the combination of choices that we make. Each and every moment we make choices that decide the rest of our lives. Some choices are easy – like what to eat for breakfast, while other choices are hard, like what T-Shirt am I going to wear. Yet buying a school bus to live in has been the easiest choice of my life. Day after day is proof and further validation of that. Today, right now, my fiancee and I are fully embracing our choices, and living our lives in accordance with the outcomes of those choices. I am alive because of my fiancee. Three years ago, at the lower point of my life, she helped me seek professional counseling, and I have worked on loving myself ever since. I've made it a daily choice to live my life without fear. Mary planted a seed of love deep in my heart the moment we first met, and she waters it every-time we’re near each other. I dedicate my life to serve her and continually make the choice every day to love her. I don’t want you to get the wrong idea. I’m selling a certain lifestyle through my writing. I’m offering an image of perfection living on a 1990 School Bus. Her on the couch, me in the dining area - she’s an arm’s length away at nearly all times in the bus. In 189 square foot, getting away means one of us is in the front of the bus and one in the back, only divided by a cloth curtain. Otherwise we go outside or leave with the car. In the past 7 months living together, we have figured out how to claim our own personal time and space, as well as fully cherishing and embracing our time together. I realize Bus Life is not for everyone and when I say “perfect” I don’t mean that everything actually is 100% completely perfect and in-tact. It’s a state of being, of mind. We can love life or we can hate life. We can blame others, or we can fix what needs fixing. I have struggled with depression for too long, and I am realizing that LOVE is the answer to all questions. I love myself, I love my soon-to-be-wife, my parents, my friends, and everyone else out there. That is the choice I am making; those are the thoughts I want to have. LOVE is free for EVERY ONE, as is the KNOWLEDGE to realize that. Like many others, we have bills that need to be paid, lack health insurance, have trouble communicating at times, among other stressors and worries. But none of that matters. Those things will sort themselves out. What mattered most today is that I am absolutely in love with my fiancee, and shes absolutely in love with me. We are able to get through anything together. Today her feet don't hurt, as she no longer works long hours for a corporation that doesn’t cherish her. I no longer work for a large company where I was only a number and a human resource. We are following our passions, with the utmost love and joy in our being, and are sending that out, accepting of whatever comes our way. So watch out America, the Big Blue Skoolie Love bus is coming to town; Driving the miles and spreading the smiles. When I ask you how your day was, what are you going to say?